Need moving boxes for electronics? Here's how to move your equipment. Computers, televisions and entertainment systems are not cheap items. In addition to being a big financial investment, they may hold your private information as well as records of family and personal memories. When you’re moving, be sure to take care to prepare and move these items properly so you won’t experience loss or damage. Proper packing and handling will help ensure that these items get to their destination in the same condition in which they left your home or work space. Check your manufacturer’s product user guide for particular handling instructions. If you don’t have the physical guide, check the manufacturer’s website for a pdf version or request a copy. Remove ink and cartridges from items such as printers and store these in sealable bags. Place the bags in the same box with the related item for quick re-installation. For DVD players and stereos, remove all CDs and DVDs from the device and pack the media items separately. Use the original packaging if it’s available to pack the equipment. If the boxes were discarded, you can request a “return kit” from your manufacturer at a small cost, or get an appropriate container from your moving company. Otherwise, a sturdy, double-walled box slightly larger than the item can be used to secure the piece of equipment. Since these are specialty items, don’t skimp on the cost of boxes and packing materials, as inadequate containers may cause the product to shift and incur costly damage. Label any areas that require disconnection so reinstallation will be easier. Use colored labels that can be written on to color code or number each port and related cable. Use twist ties to safely bundle and secure the cables. Place the wires in a sealable bag and tape it to the piece of equipment. Disconnect all attached parts. Each piece should be wrapped separately in antistatic bubble wrap. Use tape to secure the ends. The largest piece of equipment should be placed at the bottom for stability with smaller items on top. Use anti-static packing material, like styrofoam popcorn or extra bubble wrap, to fill any gaps. Items should not be able to shift or make noise during the move. Check your box carefully, or move it around to test for shifting items, and fill any additional holes and spaces with packing material. Seal the box with packing tape. Write “Fragile” in large bold letter on the side and also write which end is up on the box. Label the box with the room that you want it to go into. If your item is really large, you may need to crate it with wooden pallets for best protection. You may need professional help because these items are often very fragile and can be heavy and hard to handle as well. For medium size items that you can handle on your own, but that are too big to box, flatten some old cardboard boxes and use the cardboard to cover the surfaces and corners. Wrap the item thoroughly with bubble wrap so there’s plenty of padding. Tape it up solidly so no part of the wrapping can come loose during transport. Make sure that fragile surfaces and corners are well protected. 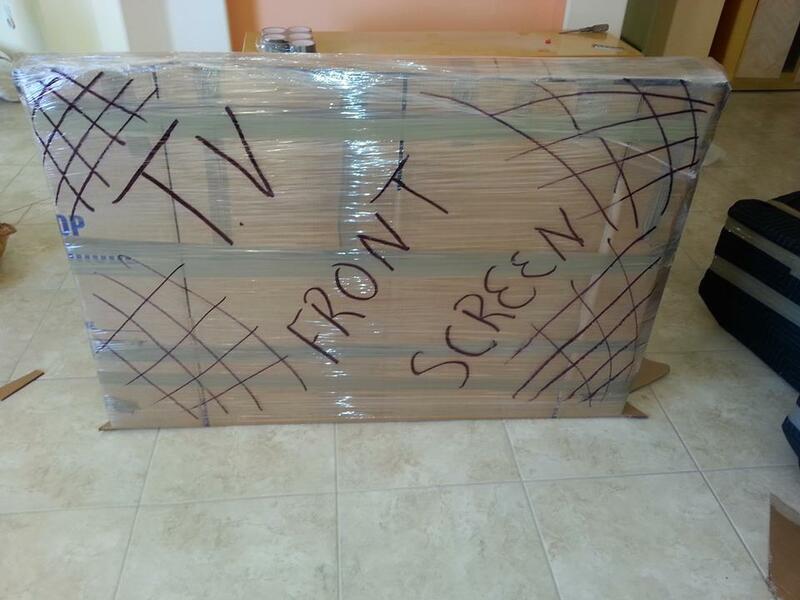 Important: Always use anti-static popcorn or bubble wrap to to pack electronics. Avoid any materials that could potentially conduct electricity. Also Worth Noting: Some electronics are heat sensitive. Software and CDs can be damaged in high temperatures. Any sensitive media would be more securely transported with you. If this may be a concern, speak with movers before arranging shipment. If you run into any problems with oversized or fragile items, or ones that just don’t quite fit into any standard moving containers, be sure to check with your professional moving company. They’re equipped and trained to safely pack and move delicate, heavy or oversize items that can overwhelm residential clients trying to do it on their own. At Move 4 Less, we’ve handled everything from antiques to chandeliers to pianos and gym equipment. 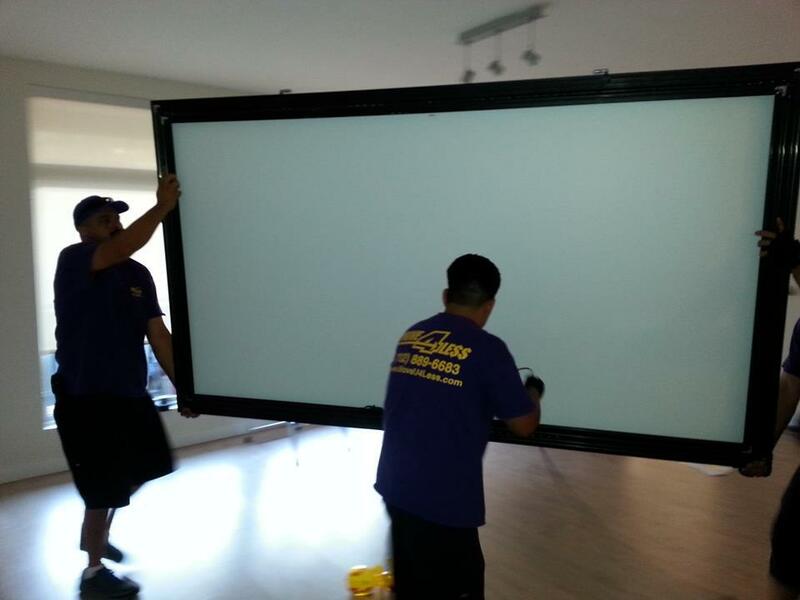 And we’re very experienced at moving big screen entertainment systems and other home electronics systems. With a little planning and attention to detail, all your home or office electronics will arrive safe and sound and be up and running at the new place in no time.